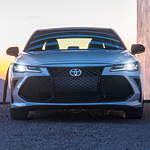 The Toyota Avalon is a full-size sedan with style. It is built for touring with sleek, aerodynamic lines and a sporty personality. The overall shape of the Avalon makes it a quiet, fuel-efficient vehicle. Vents on the front bumpers and underbody panels let it slip smoothly through the air. An optional rear spoiler and diffuser bring the coefficient of drag down even further to .27. Aerodynamics are great, but what really gets this car noticed around Latham are the assertive style features. When you test drive the Avalon at Northway Toyota, the first thing you see is the sporty black mesh grille. Then your eye catches the 19-inch wheels with a striking pattern of glossy black and bright, machined spokes. You’ll find the dual exhaust with quad tips at the rear of the car. If you want bold styling in a fuel-efficient, full-size sedan, take a look at the Avalon.